Tehran (AFP) – Iranian protesters have attacked a religious school in Karaj province near Tehran, the conservative Fars news agency reported Saturday, as sporadic protests simmered ahead of the reimposition of US sanctions. “At 9:00 pm (1630 GMT on Friday) they attacked the school and tried to break the doors down and burn things,” Fars quoted the head of the school in the town of Ishtehad, Hojatoleslam Hindiani, as saying, giving only his clerical rank and no first name. But it said these peaceful protests were taken over by people “who come into the crowd with political slogans such as ‘Death to the dictator'”. AFP / Simon MALFATTO. 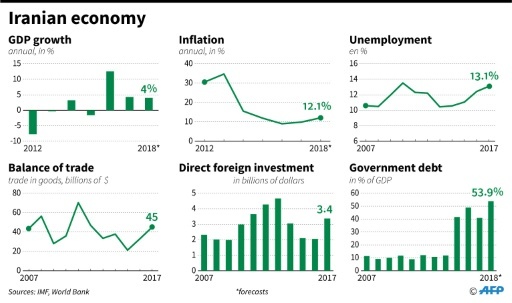 Key economic statistics about Iran. AFP/File / ATTA KENARE. A man withdraws Iranian Rial notes in the capital Tehran on July 31, 2018. The first phase hits on Tuesday with blocks on financial transactions and imports of raw materials, as well as sanctions on Iran’s automotive sector and commercial aircraft purchases. 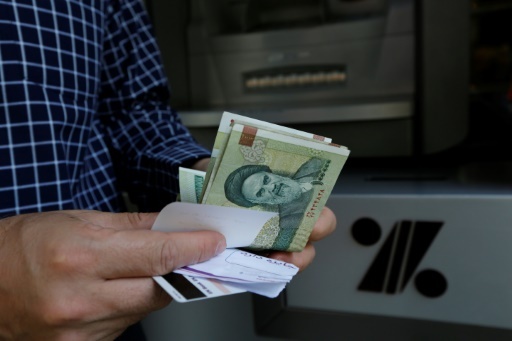 Remaining sanctions — including on Iran’s oil and gas sector and central bank — will resume on November 5. Although smaller foreign firms have vowed to work around the US measures, multinationals such as France’s Total and Peugeot, and Germany’s Siemens have already said they will have to pull out. Islamic Consultative Assembly News Agency/AFP/File / HO. 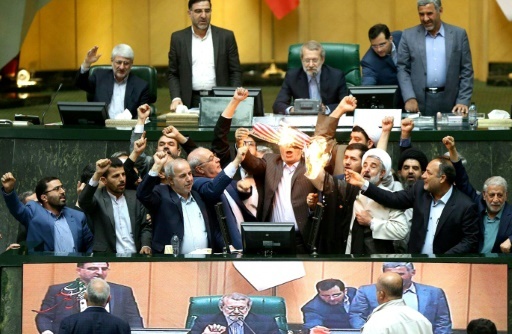 Iranian MPs burn an American flag on May 9, 2018, after US President Donald Trump withdrew from the nuclear accord. Picture provided by the Iranian Parliament. “There is a massive loss of confidence in the financial system and the government’s ability to control things and withstand sanctions,” she told AFP. 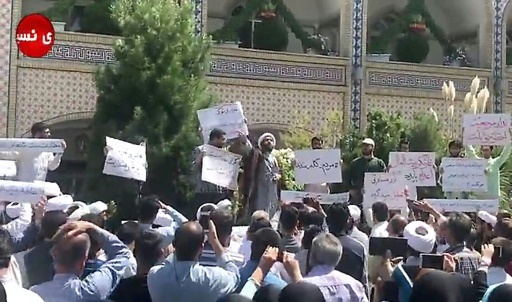 NASIM NEWS AGENCY/AFP / – A cleric speaks to protesters in the holy city of Mashhad on August 3, 2018, from a video by Nasim News Agency.